Swap spreads (see a short primer on the subject here) are excellent coincident and leading indicators of financial market and economic health, as well as direct indicators of systemic risk. Swap spreads are now very low and declining in most developed countries. This bodes well for growth in the coming year. 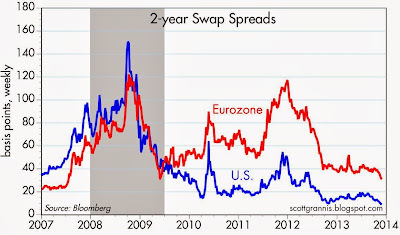 The first of the above charts shows 2-yr swap spreads for the U.S. and the Eurozone. 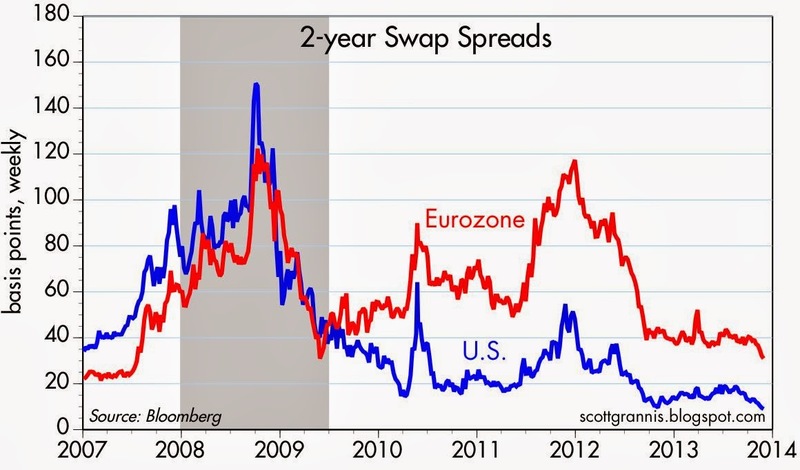 U.S. swap spreads are now about as low as they have ever been, and Eurozone 2-yr swap spreads are at a new post-recession low. The second of the above charts shows 2-yr swap spreads in Japan, which have also fallen to close to their lowest levels ever. Very low swap spreads are indicative of financial markets that enjoy abundant liquidity conditions thanks to Quantitative Easing measures by the world's major central banks. The global banking system hasn't been this healthy for a long time. With banks on a solid footing and with a virtually unlimited ability to lend (thanks to abundant excess reserves), the only thing standing between today's modest economic growth rates and much faster real growth in the future is more confidence and new incentives to take on risk (e.g., lower tax rates on income and capital that boost the after-tax reward to work and investment). Meanwhile, the virtual absence of systemic risk makes holding cash—which pays almost nothing— quite unattractive, especially when compared to the much higher yields available on alternative investments. UPDATE: As the above chart shows, corporate credit spreads are now at post-recession lows. This helps confirm the message of swaps, namely that systemic risk is quite low these days. 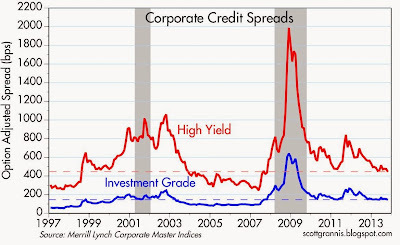 However, I would note that credit spreads have been quite a bit lower in the past. That suggests that corporate bonds—particularly those with lower credit quality ratings—continue to be attractive relative to Treasuries. The TIPS market (Treasury Inflation Protected Securities) has been around since 1997. 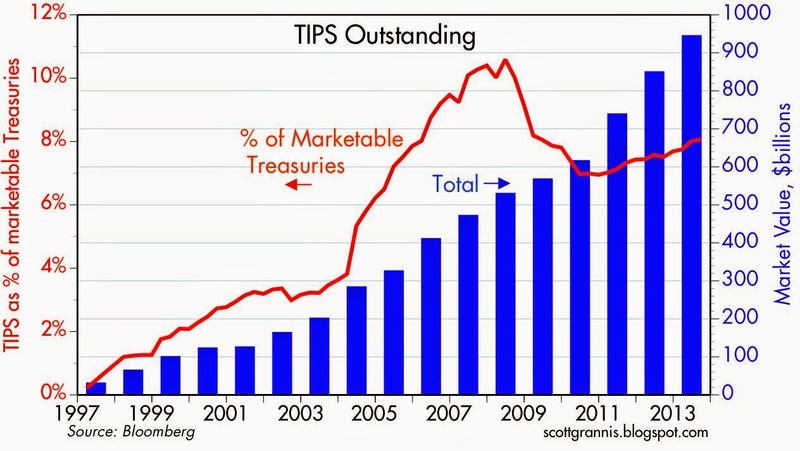 There are now almost $1 trillion of marketable TIPS outstanding, representing about 8% of marketable Treasury debt outstanding. It's a serious and liquid market, and quite valuable from an investor's perspective, since it gives us a reliable source for ex ante real interest rates across the maturity spectrum, a window into the market's inflation expectations, and a gauge for how strong the market thinks the economy is likely to be. Today, TIPS are telling us that inflation is expected to be low for as far as the eye can see, and the economy is expected to be weak for some time to come. 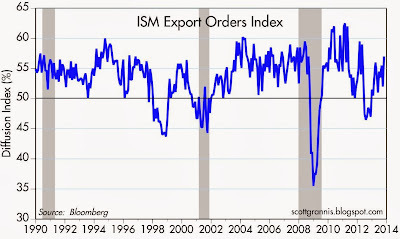 This is the "line" that investors are betting against today, no matter what the surveys of investor opinions tell you. TIPS are unique among bonds, in that while they pay a fixed rate of interest (which is the real yield), their principal is adjusted monthly for inflation, and everything is guaranteed by the U.S. government. TIPS are thus the only instrument in the world that can guarantee a real return to an investor. Real returns are the Holy Grail for all investors, of course, because if you don't earn a return that is greater than inflation, then your investment will not increase your future purchasing power. 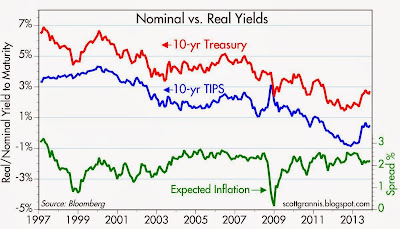 Prior to TIPS, we could only know what real rates were ex post, by subtracting inflation from nominal yields. Now we know what risk-free real yields are expected to be out to 30 years, and that sets the floor for all other expected real yields. The relatively low real yield on TIPS today means that real returns on other assets are expected to be relatively low also. For example, the low level of real yields on TIPS tells us that investors are not very optimistic about the future returns on equities. 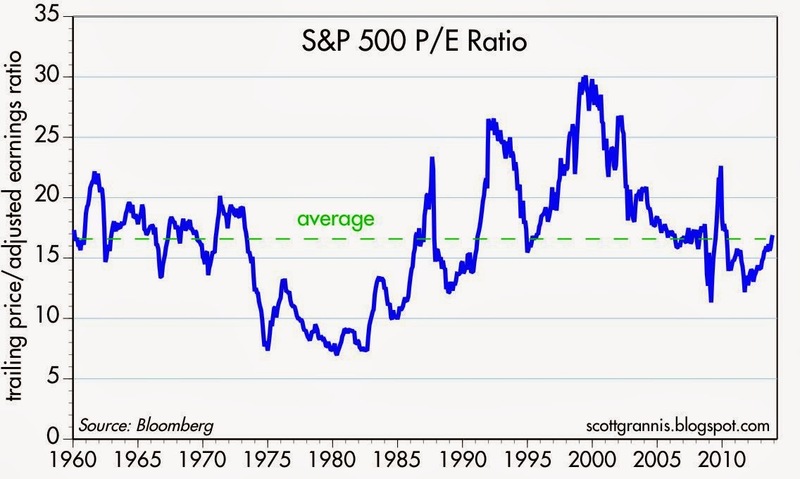 This dovetails with the current PE ratio of the stock market, which is merely average at a time when corporate profits are at record highs. 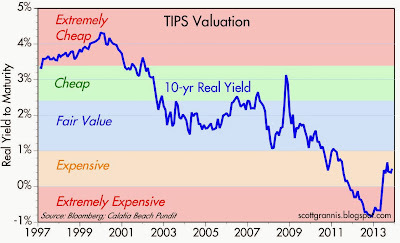 The above chart shows the real yield on 10-yr TIPS from their inception through today. I've added my judgment on what the level of real yields means in regards to valuation. The higher the real yield, the more attractive TIPS are as a standalone investment. The lower they are, the less attractive. 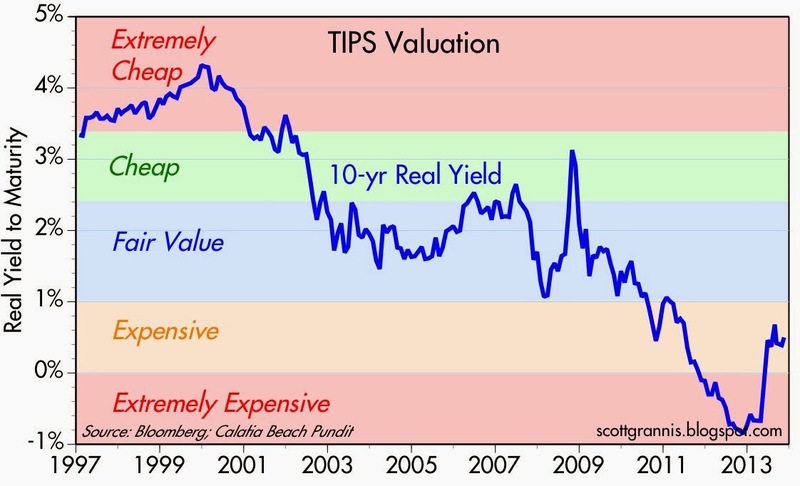 The real yield on TIPS moves inversely with their price, so high real yields mean that TIPS prices are low, and low real yields mean TIPS prices are high. In the early years, TIPS offered investors a guaranteed real yield of around 4%, which was extremely attractive from an historical perspective. Few investments have ever delivered 4% real returns over a 10 year period, but 10-yr TIPS back then guaranteed that result. I doubt that TIPS will ever carry a real yield of more than 5%, because it's hard to imagine that other investments could ever be expected to generate real returns in excess of 5% for so many years. 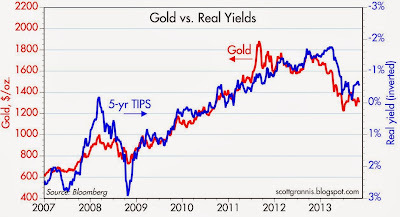 Since TIPS are risk-free, their real yield is effectively the minimum real return that the market demands. Recall that back in the late 1990s and early 2000s, investors expected the bull market to continue forever. 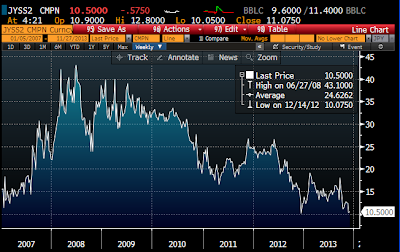 One year ago, real yields on 10-yr TIPS fell to almost -1%. That meant that investors were willing to give up 1% of their purchasing power every year just to have the security of TIPS. TIPS were extremely expensive, because the market was extremely risk-averse and very concerned that the future of the U.S. economy was bleak, and that the returns to be had from other investments were very unappealing. Currently, 10-yr real yields are only 0.6%. 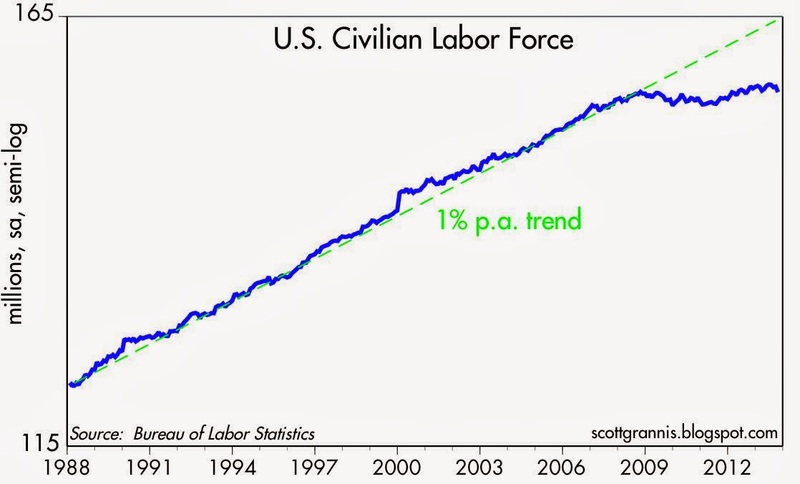 That's a lot better than -1%, but it's not very attractive from an historical perspective. Buying TIPS today means paying a stiff price for the risk-free nature of TIPS and their unique ability to compensate holders for whatever future inflation there may be. The combination of the fixed coupon and the inflation adjustment to the principal of TIPS gives you a nominal yield that rises and falls as inflation rises and falls. For example, if inflation over your holding period is 5% per year and the real coupon on the TIPS you own is 1%, then you will receive a nominal annual yield on your TIPS investment of 6.05%. If inflation rises to 10%, you'll get a nominal annual yield of 11.1%. 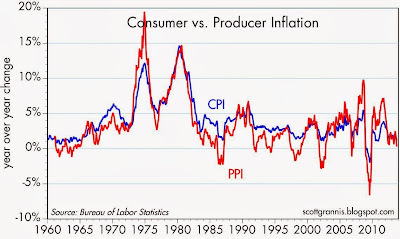 If inflation falls, you get less, but: TIPS have an asymmetrical response to inflation and deflation. If inflation should turn negative (i.e., deflation), you won't be penalized if you hold the TIPS to maturity, since the principal amount will mature at the original par value—meaning you will end up with whatever the original real yield was. In short, TIPS not only offer inflation protection, but also deflation protection. The chart above shows the nominal yields on 10-yr Treasuries, the real yield on 10-yr TIPS, and the difference between the two yields, which is the market's expected average annual inflation rate (based on the CPI) over the next 10 years. 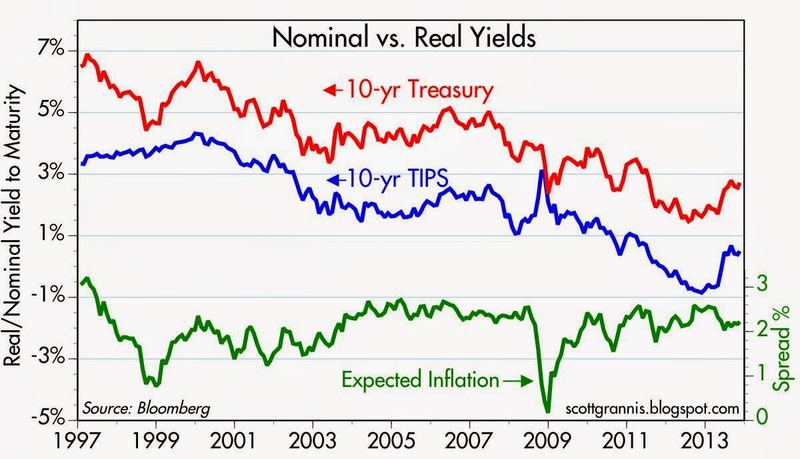 I note that although nominal and real yields have been trending down for the past 16 years, and have fluctuated between -1% and 7%, the trend in expected inflation has been relatively flat. The bond market today expects the CPI to average 2.2% over the next 10 years, and that is very close to what the CPI has averaged over the past 10 years: 2.4%. In other words, the bond market is expecting that the next 10 years are going to be pretty similar, inflation-wise, to the past 10 years. Ten years ago, the bond market was expecting CPI inflation to average 2.3% over the subsequent 10 years, because nominal yields on 10-yr Treasuries were 4.3%, and real yields on 10-yr TIPS were 2%. With the benefit of hindsight, the bond market back then was pretty smart—it only underestimated future inflation by 0.1% per year. 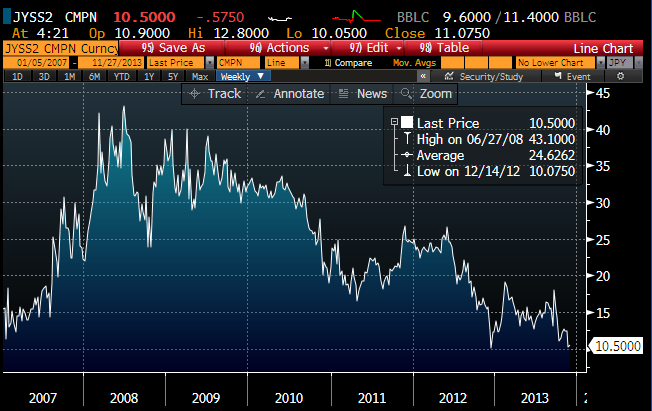 Is the bond market just as likely to be guessing correctly today? Unfortunately we have no way of knowing. I'm reluctant to place a lot of trust in the bond market's current forecast of relatively low inflation for as far as the eye can see, mainly because the Fed's QE monetary policy has yet to be reversed, and we have no way of knowing if the Fed will navigate the uncharted waters of reverse-QE successfully. At the very least, QE has created a lot of uncertainty about the future of monetary policy and inflation. With TIPS expensive and priced to an optimal monetary policy result, I'd rather take my chances on inflation coming in higher than expected—better to sell TIPS and Treasuries than to buy them. With Janet Yellen at the helm (a career dove), the Fed is likely to err on the side of higher inflation. How high is anybody's guess. TIPS can also tell us about the expected health of the U.S. economy. 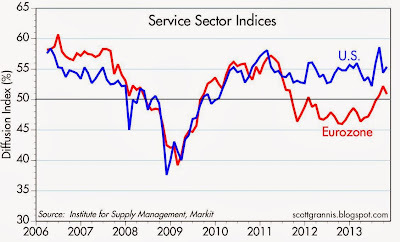 The above chart compares the yield on 5-yr TIPS to the 2-yr annualized rate of growth of the U.S. economy. 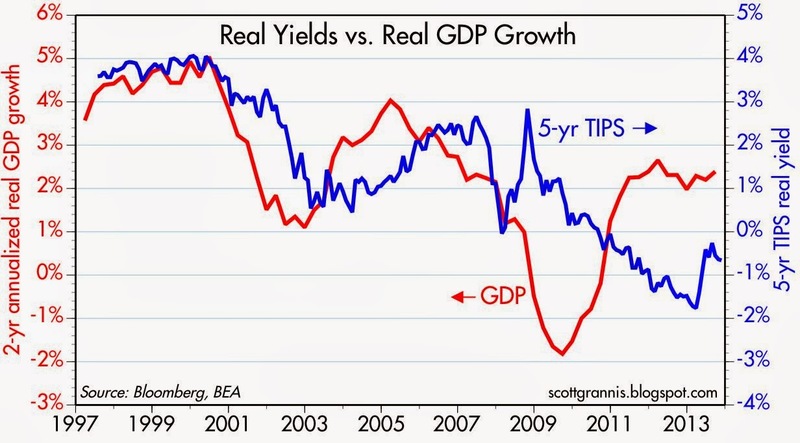 The idea behind this chart is that the risk-free, guaranteed real yield on TIPS tends to track the market's perception of the real growth potential of the U.S. economy. 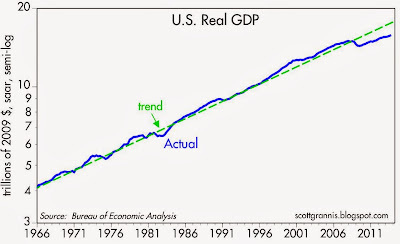 In the late 1990s, the economy was booming, with growth rates in excess of 4%. 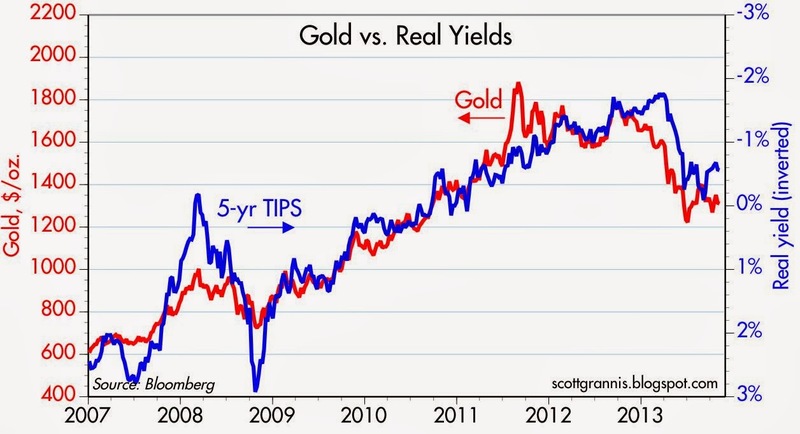 So it's not surprisingly that TIPS yields were 3-4%. 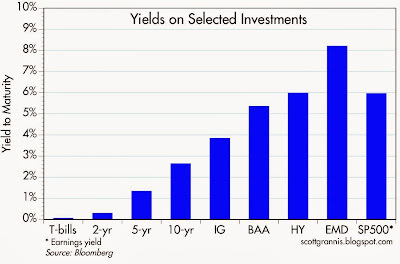 If the economy is expected to grow 4% a year forever, then the risk-free real yields on TIPS ought to be a little less in order to remain competitive with expected real returns on other assets. Today, the market looks back and sees that the U.S. economy has been growing some 2-3% per year for the past four years. This would seem to call for 5-yr TIPS yields of 1-2%, but 5-yr TIPS today have a real yield of about -0.6%. This suggests that the market worries that economic growth could slip below 2% in the next few years. If growth comes in better than 3%, the real yields on TIPS ought to move substantially higher. Personally, I like taking the odds that economic growth will be better than dismal, and I like the odds that inflation will be higher in coming years than it has in the past. Accordingly, I like equities, real estate, and high-yield debt. By the same logic, cash, Treasuries, TIPS, and MBS are relatively unattractive because real and nominal yields are likely to rise by more than the market expects. October retail sales growth was a good deal stronger than expected (+0.4% vs. +0.1%), but from a longer-term perspective, sales growth is only modest and still substantially below trend. This is consistent with a slow-growing economy that nevertheless is managing to overcome significant headwinds (e.g., the government shutdown, very weak labor force participation, widespread risk aversion on the part of consumers, banks, and businesses, a very burdensome regulatory environment, and high marginal tax rates on income and capital) to continue to grow. It's amazing, really, that the economy is doing as well as it is. 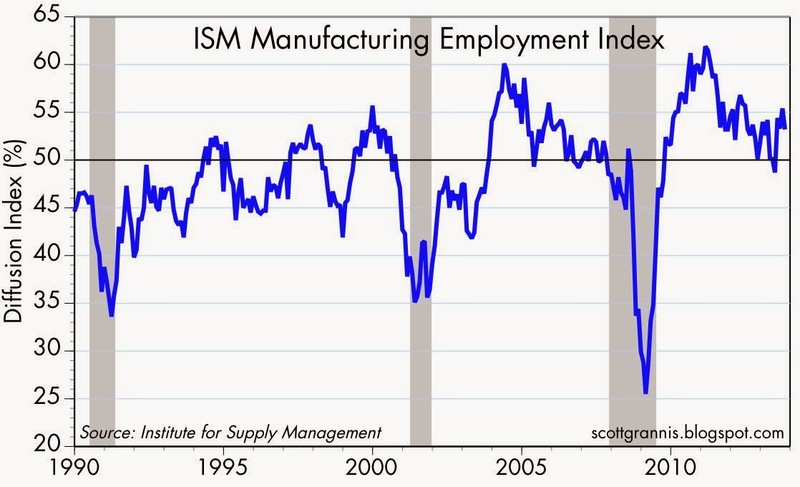 If these headwinds could be reversed, there's no telling how strong the economy might be. 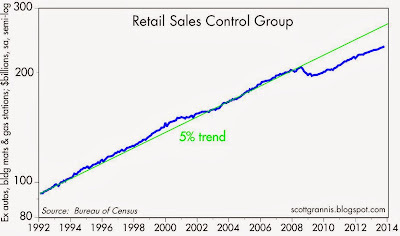 This chart shows the retail sales "Control Group," which strips out the most volatile sectors (autos, building materials and gas stations). Here we see steady growth, but at an unremarkable pace. 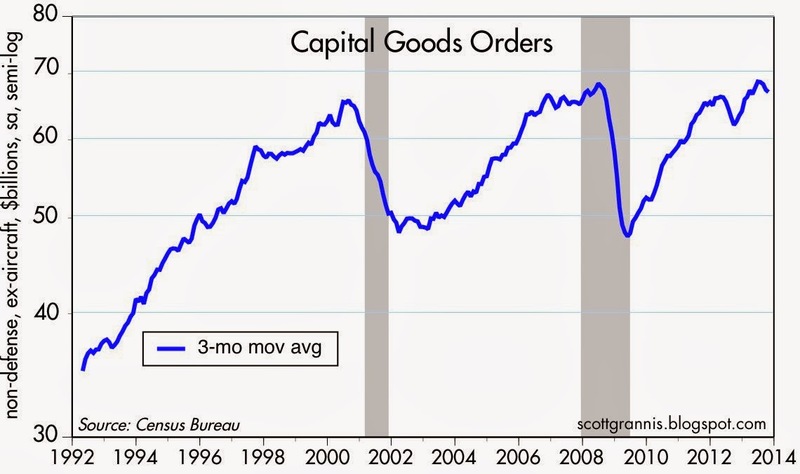 Like the overall economy, sales activity is at least 10% below where it otherwise might be if the prior long-term trend were still in place. 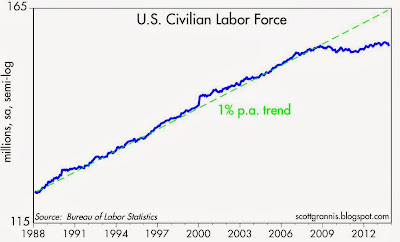 The lackluster performance of the economy can be almost completely explained by the lack of growth in the labor force (those working and looking for work). Upwards of 10 million people have "dropped out" of the labor force, giving up in their search for jobs. 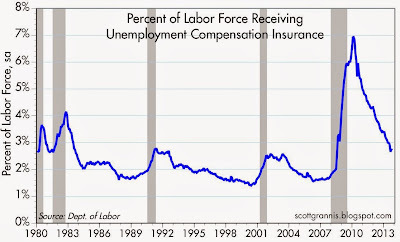 This can be traced in part to an increase in government transfer payments (e.g., extended unemployment benefits, easier-to-get food stamps, more people on disability, higher marginal tax rates which fund increased tax subsidies, and so-called stimulus spending, all of which reward the lack of work), higher minimum wages (which make it harder for businesses to hire), and the increased burdens and uncertainties that have arisen with the coming launch of ObamaCare (which have made small businesses reluctant to expand), to name a few. 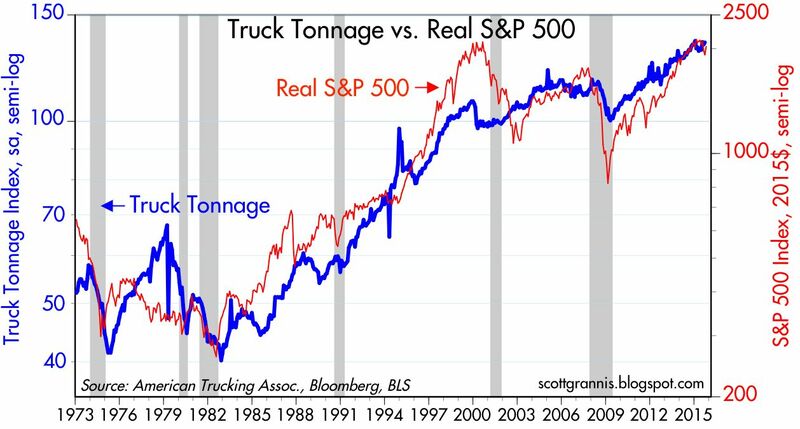 The amount of tonnage hauled by America's trucking industry fell 2.7% in October, but was up a strong 8% from October of last year (i.e., this can be a very volatile statistic and seasonal adjustments may be faulty—despite all that, the index is clearly increasing). This is one of those real-life statistics that, while it may not be perfect, measures the increasing physical size of the U.S. economy in a way that few other statistics can. 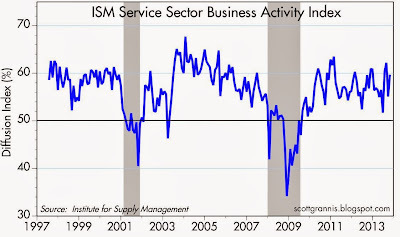 The weakness in October likely had lots to do with the government shutdown that month; if so, activity should bounce back next month. UPDATE (Oct. 19, 2015): At the request of a reader, here is an updated version of the first chart in this post. Truck tonnage continues to increase—rising 3.1% in the year ending September. 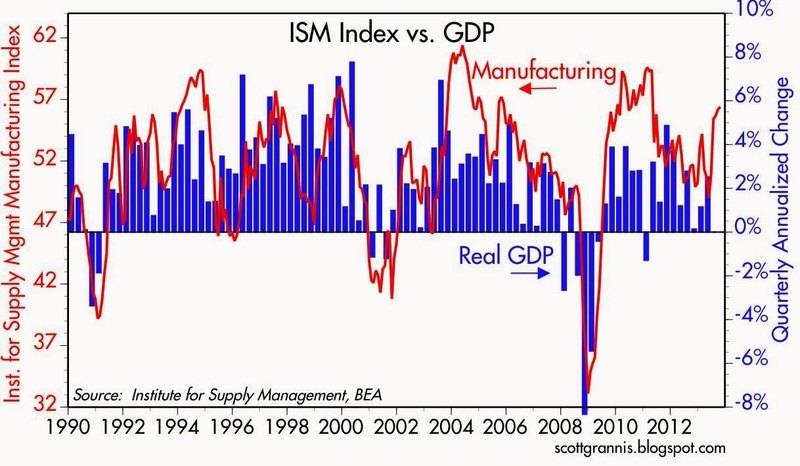 That suggests that the physical size of the economy is still growing, and that would in turn support an increase in the real value of equities. The peak in the real S&P 500 happened last February, and equities are down 4-5% since then. The Fed continues to assert that its Quantitative Easing bond purchases will boost economic growth by lowering borrowing costs for businesses and consumers. But the evidence shows that QE bond purchases have actually coincided with increases in long-term interest rates. The Fed is thus guilty of misleading the public; it should be arguing that its QE efforts have been successful because they have boosted long-term interest rates—interest rates are up because the outlook for the economy has improved, and QE has likely contributed to that improvement by satisfying the world's huge demand for safe assets. The above chart shows the yield on 10-yr Treasuries (blue), overlaid by shaded areas representing periods of Quantitative Easing (darker green) and the one period of Operation Twist (light green). 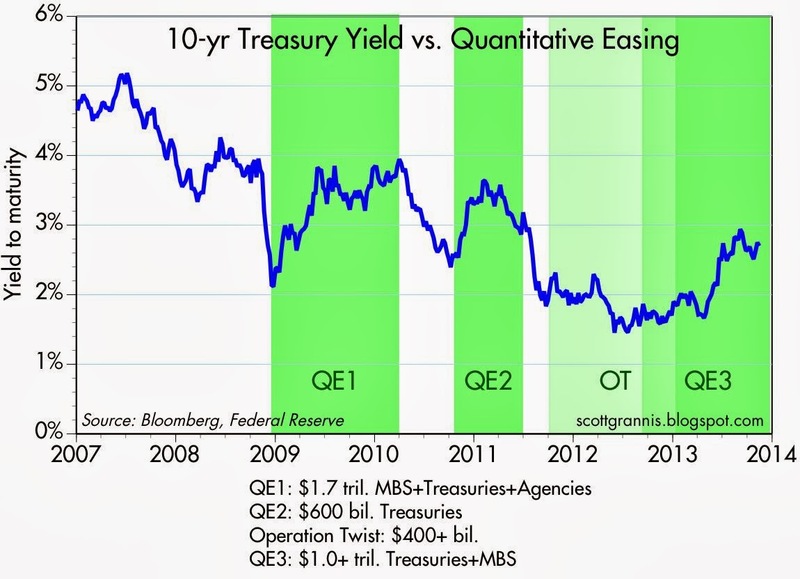 Note that yields rose on net during each period of Quantitative Easing, and only fell when the Fed was NOT purchasing bonds. Operation Twist also failed to deliver on its promise, since 10-yr yields were roughly unchanged despite purchases of $400 billion longer term bonds and corresponding sales of shorter term bonds. 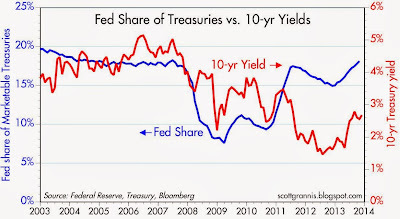 The above chart compares the yield on 10-yr Treasuries (red line) with the percent of marketable Treasuries held by the Fed as a result of its QE purchases (blue line). Note that the Fed today holds about 18% of marketable Treasuries, which is almost identical to what it held in the years leading up to QE, yet yields are substantially lower—there's no discernible correlation between the amount of bonds the Fed owns and the level of yields. 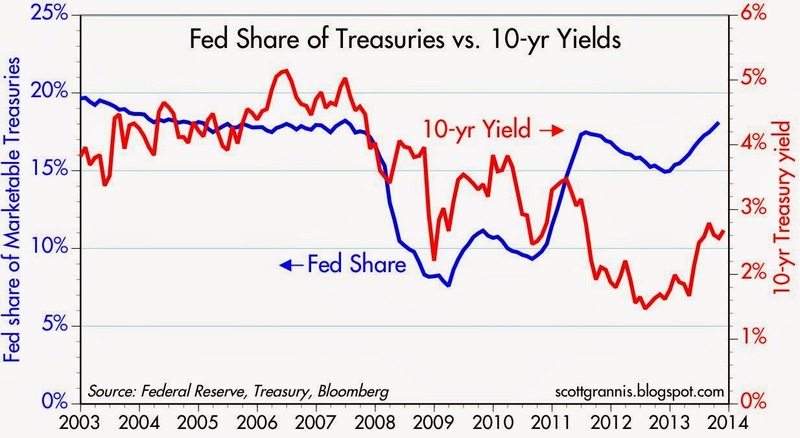 Note also that over the past four years the Fed has significantly boosted not only its purchases of Treasuries but also the portion of marketable Treasuries it holds, yet interest rates are largely unchanged on net. Note further that 10-yr Treasury yields have jumped over 100 bps since early May, even as the Fed has stepped up its purchases and its percentage ownership of marketable Treasuries. There is no evidence in either of the two charts above to support the notion that QE bond purchases have inflated bond prices or depressed bond yields. 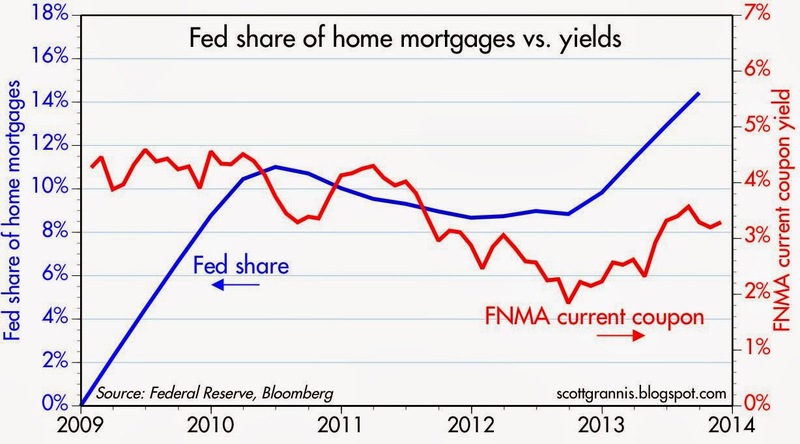 The same arguments apply to the Fed's purchases of mortgage-backed securities. 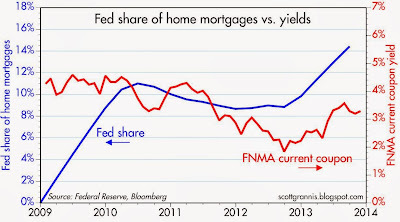 As the chart above shows, the Fed has dramatically increased its ownership of MBS over the past several years, yet there is no indication that increased purchases have had a depressing effect on mortgage yields. Over the past year, during which the Fed has purchased $40 billion of MBS per month, mortgage yields have actually increased by about 100 bps. 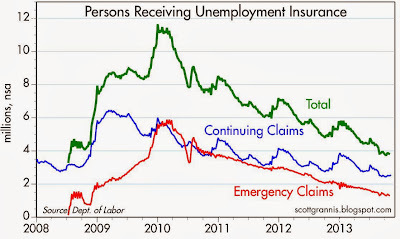 One explanation for why the Fed's QE efforts have not produced their promised results is relatively simple. The Fed has purchased only a relatively small portion of the outstanding supply of Treasuries and MBS, and that is not enough to materially change the yield on all outstanding bonds. The outstanding supply of marketable Treasuries and MBS is almost $21 trillion, while the Fed owns only about $3.6 trillion. 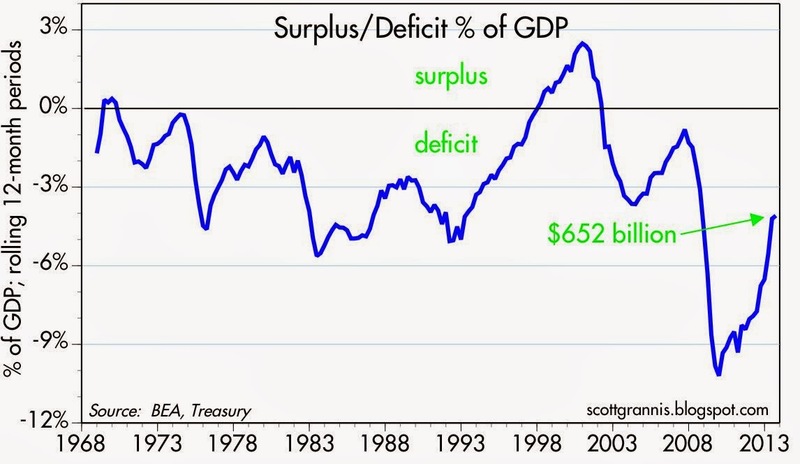 More important is the fact that there are tens of trillions of corporate and non-U.S. bonds that are effectively priced off of Treasuries. To artificially depress the yield on Treasuries the Fed would have to not only buy a huge portion of outstanding Treasuries but also a significant portion of corporate and non-U.S. bonds. 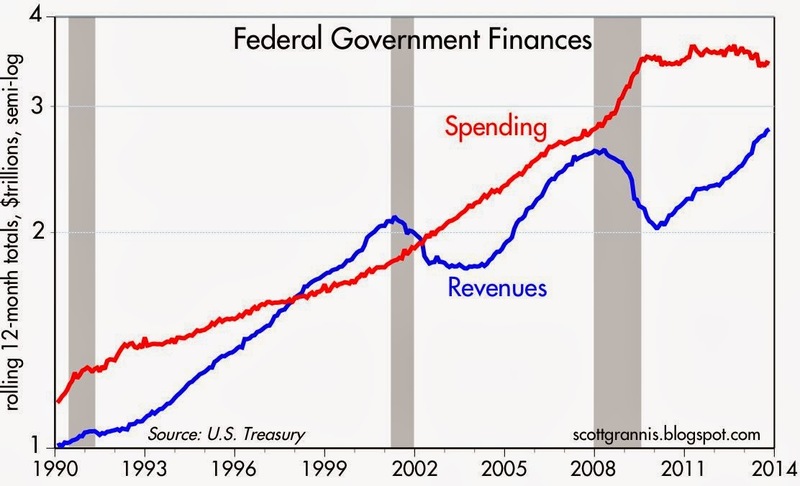 It's also a myth that the Fed has been "printing money" with abandon as a result of its QE bond purchases. This myth persists, despite strong evidence to the contrary (i.e., the fact that inflation remains very low despite four years of massive QE purchases), because the majority of observers fail to understand the mechanics of Quantitative Easing. QE bond purchases do not create money; they create bank reserves, which are very different from money. Bank reserves can't be spent anywhere, because they exist only on the Fed's balance sheet. Banks don't lend bank reserves, they use them to collateralize their deposits, which in turn are a function of total lending activity. The huge expansion of bank reserves could potentially result in a huge expansion of the money supply (banks need extra reserves to support increased lending), but it has not, because a) banks have been reluctant to expand their lending activities, and b) the public has been reluctant to borrow more. Not only banks, but the entire world remains relatively risk-averse, preferring to hold significantly more cash and cash equivalents, of which bank reserves are an important part. As I predicted last month and two months ago, Obama's signature domestic achievement is turning into a nightmare that will seriously and negatively impact the lives of tens of millions of people. 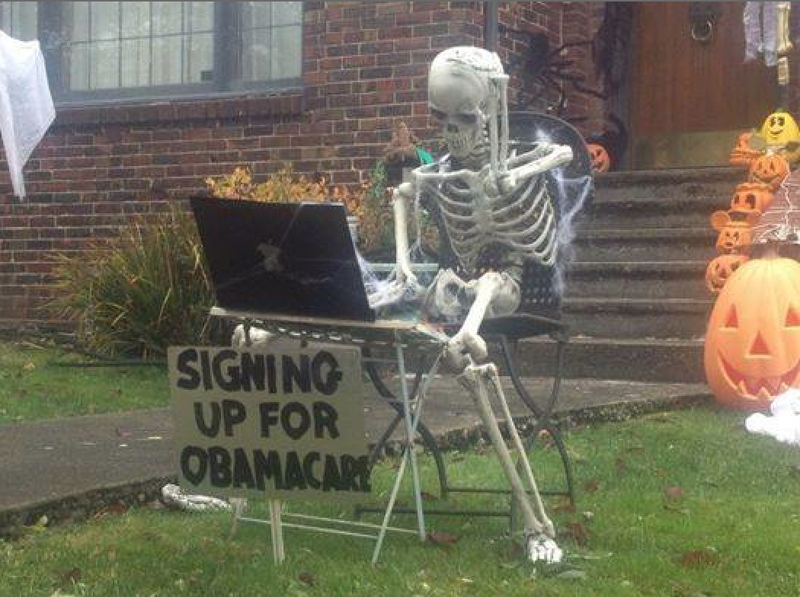 Today Obama tried to limit the damage by effectively postponing the individual mandate for a year. He didn't exactly postpone the individual mandate, however. As with the employer mandate, what the White House has done is to announce that it will not enforce the law that mandates individual compliance. Obama's style of governance is increasingly reliant on the non-enforcement of laws—even those of his own making—that, owing to the Law of Unintended Consequences, prove to be problematic and troublesome. Obama probably figures that he has found a clever solution to the problem of millions of policies being cancelled. Now that he has announced that the individual mandate not be enforced, any insurance company that goes on to cancel an existing policy will be to blame for the cancellation. Insurance companies were eager to get in bed with the Democrats when ACA was being designed because they figured it would create millions of new healthcare policies. Now that same industry, once so eager to participate in crony capitalism, finds itself being thrown under the bus. Renewing millions of existing policies will subtract still more from the ranks of those buying policies on the Obamacare exchanges, and that in turn will result in heavy losses to an industry that banked on those people buying new, higher-priced policies. This is not the way to fix the fatal flaws of Obamacare. It's also not the way to run a country, and it's not the way to transform one-sixth of the U.S. economy. We cannot continue down this path much longer, because the current system will not and cannot work to the satisfaction of everyone. The underlying problem with Obamacare is that it too reliant on government mandates, regulations, and subsidies; too much government, and not enough room for free market forces to figure out better and cheaper solutions. The way to proceed is not difficult to discern, as Ponnuru and Levin point out in their WSJ op-ed today: "A Conservative Alternative to Obamacare." So even though the news is depressing, and even though sensible solutions seem to have little chance of taking root, I remain optimistic. That's because the path of least resistance at this point is shaping up to be very attractive: less government and more room for the private sector to tackle the healthcare problem. Maybe, just maybe, politicians will at some point realize that we need to fix the broader economy in the same way that we can fix Obamacare. The private sector currently is heavily burdened with taxes and regulations that can be lifted. 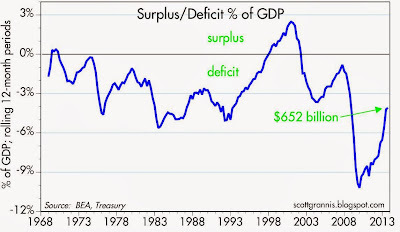 One of the biggest and best pieces of news these days is the ongoing collapse of the federal budget deficit, which has fallen from a high of 10.5% of GDP to now just 4% of GDP, and over the past 12 months has totaled only $652 billion, down from a high of almost $1.5 trillion four years ago. 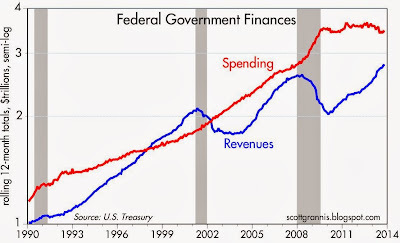 All this has happened thanks to an effective freeze in government spending accompanied by modest growth in the tax base (i.e., more jobs, higher incomes, more profits), and some modest hikes in tax rates. Why don't we consider reducing the corporate income tax rate and limiting corporate tax subsidies and deductions? Why don't we do away with subsidies and deductions and lower marginal income tax rates for everyone? If legislation to this effect were to pass tomorrow, coupled with conservative, free-market reforms to Obamcare, I would immediately forecast 4-5% GDP growth over the next year or so. 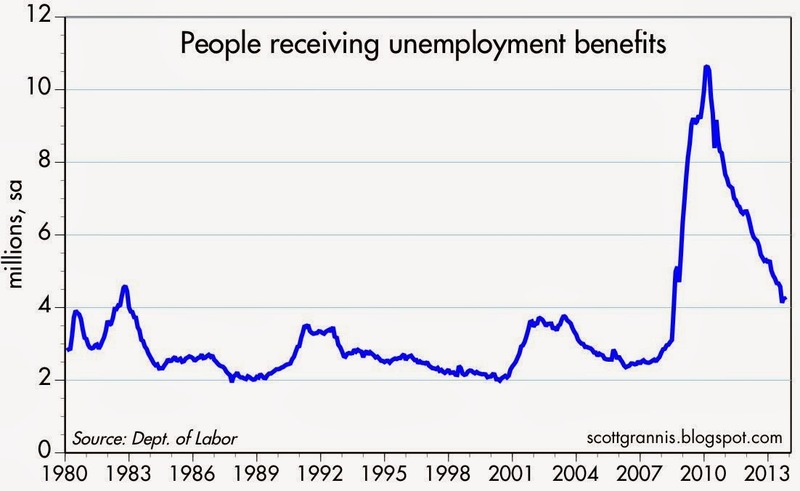 This happened once before, in mid-2003, with the Bush tax cuts, and it can happen again, especially now. The best solution to the current mess is a growth solution which transfers power from government bureaucrats to the private sector. The bad news is that Obamacare is doomed; the good news is that it can be replaced by something far better. We are spending a week at our favorite spot in paradise, the Napili Kai Beach Resort on Maui. It is so peaceful and beautiful that it's hard to get upset or excited about what's going on in the rest of the world. Which is not so bad, considering that—apart from the impending failure and/or postponement of Obamacare—nothing much has changed. The economy is growing slowly, but it is growing and getting slowly better. There are no signs of distress in the financial markets or emerging weakness in the economy that I can see, and yet markets are still priced to caution and risk aversion. Risk assets still look attractive relative to cash. The October jobs report handily beat expectations (204K vs. 120K), but that only means that the economy was not weakening in recent months as many had feared. The important trends that have been in place for the past three years—2% annual growth of private sector jobs, and no increase in part-time employment—remain intact. The economy continues to grow at a modest pace. 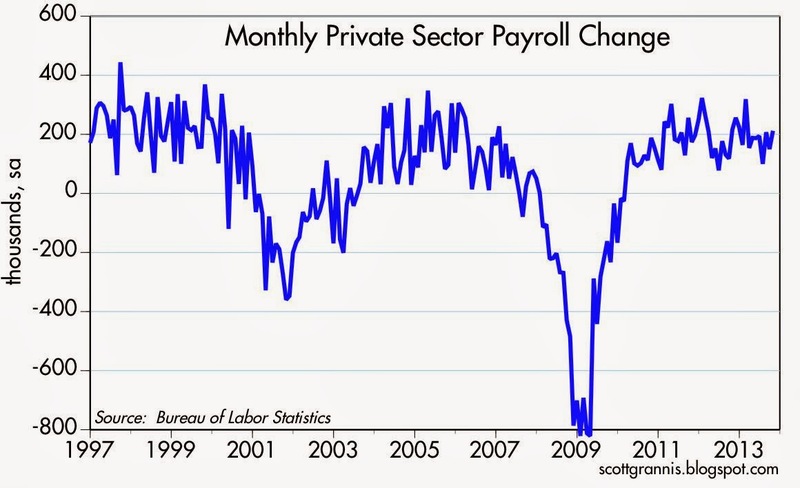 These two charts show the monthly changes in private sector jobs and their 6-mo. 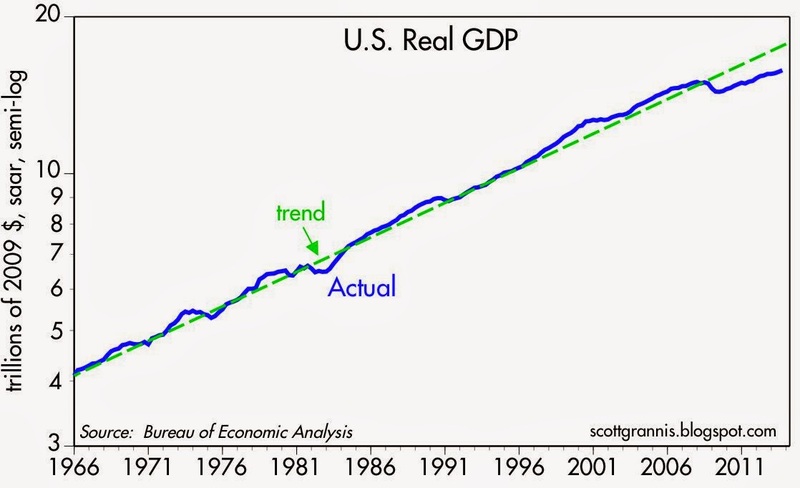 annualized rate of growth. 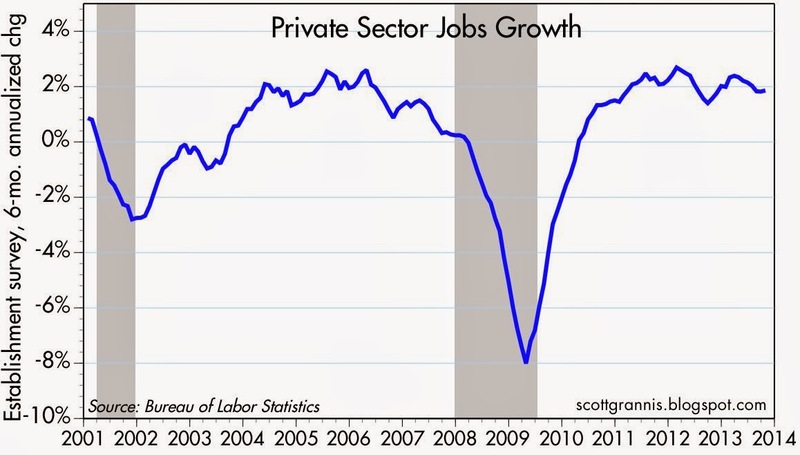 As should be apparent, jobs growth in this recovery has been quite similar to what we saw in the previous recovery. The private sector has been generating new jobs at the rate of about 2% per year, while the public sector—thank goodness—has been shedding jobs. 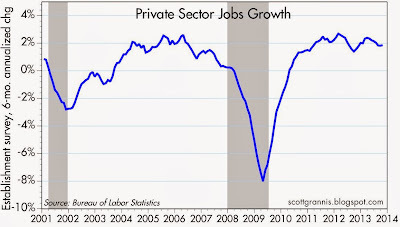 (Though I would add that public sector jobs have been roughly flat over the past year.) That kind of jobs growth is only enough to give us 2-3% annual real growth in the economy (real growth is approximately equal to jobs growth plus productivity growth, which has averaged about 1% per year over time), which continues to be disappointing. Jobs growth will need to accelerate from here before we can get optimistic about a significant improvement in the economy. 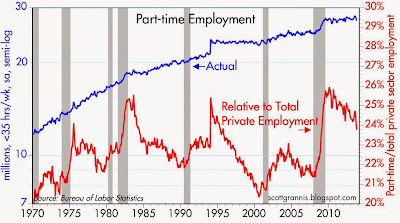 The popular belief that the only jobs growth we have is coming from part-time jobs is a myth, as I explained in detail here. 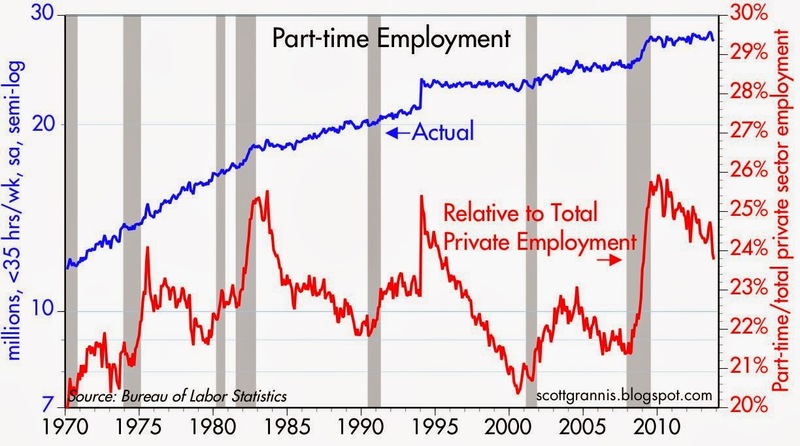 As the chart above shows, there has been zero growth in part-time employment ever since the recovery started. 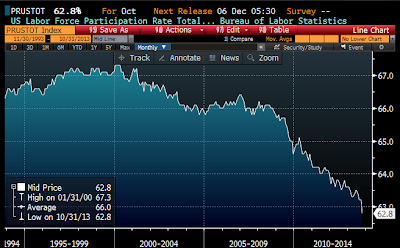 The ratio of part-time to total jobs has been falling since that time, just as it has during every recovery. There is nothing going on here that is unusual. What is unusual—and disturbing—is the ongoing decline in the labor force participation rate, shown above (the last data point reflects the government shutdown and will probably be reversed next month). 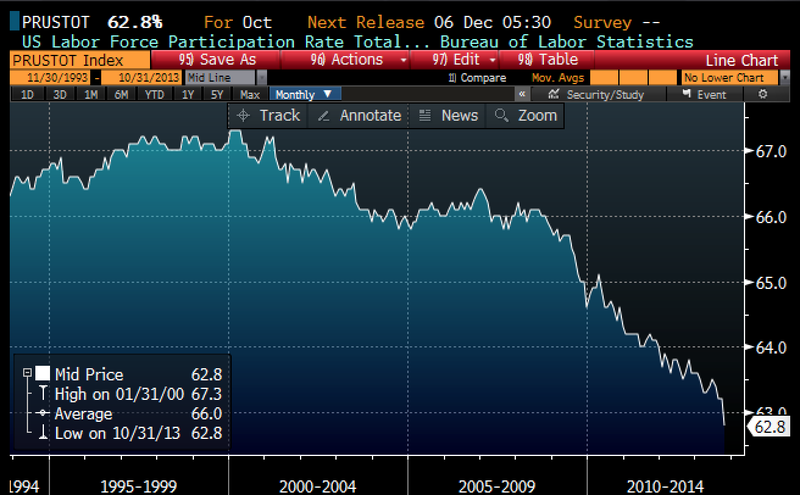 The decline in the participation rate began in earnest in 2009, and demographics cannot explain such a sudden change. 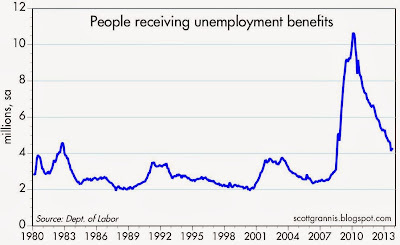 What did change in 2009 were two government programs designed to pay people for not working: food stamp eligibility was significantly expanded, and unemployment benefits were extended in unprecedented fashion. This most likely contributed to people's decision to drop out of the labor force, though I suspect there are other factors at work as well. The government shutdown last month only showed up in the household survey (red line), where jobs declined by a huge 735K, with the bulk of that declining coming from public sector jobs. This will likely be reversed next month. Today's report adds to the body of evidence which suggests there is little or no reason for the Fed to continue its QE program. As reported yesterday by Jeff Cox of CNBC, the Fed is likely on the verge of making an important policy change (HT: Calculated Risk). Within the next several months, the Fed is likely to announce the tapering of QE. That's not a big surprise, but this time there is an interesting twist: in order to offset the risk that tapering might cause interest rates to move higher—which could slow the still-weak housing market and the still-weak economy—the Fed will also announce a lowering of the unemployment rate threshold that would prompt them to begin raising interest rates. 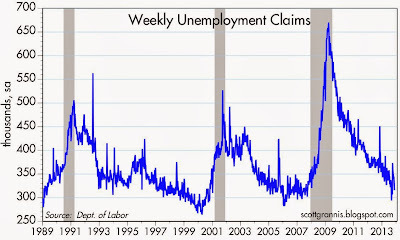 By doing this the Fed would be removing some of the unwinding risk that continued tapering creates, while at the same time keeping bond yields from increasing, since a lower unemployment rate threshold would significantly extend the period during which the Fed would keep short-term interest at or near zero. The official justification for this move would be to strengthen the economy. 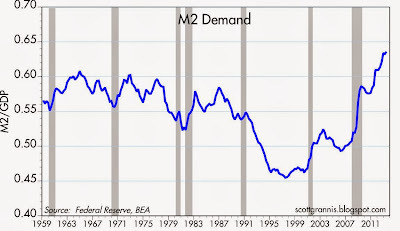 But for those of us who believe that monetary policy has little or no ability to create economic growth, the real reason the Fed would make this move is to aggressively weaken the demand for cash and cash equivalents (e.g., currency, T-bills, bank savings accounts, and bank reserves). If the Fed succeeds in convincing the world that cash and cash equivalents will pay next to nothing for the next few years (i.e., the time it would take for the unemployment rate to fall to the Fed's new threshold), then the world's demand for that cash is most likely going to decline. As the chart above shows, there's an awful lot of "cash" out there that pays almost nothing: over $7 trillion of bank savings deposits, $0.7 trillion of retail money market funds, $0.6 trillion of small-denomination time deposits, and $1.4 trillion in checking accounts. And let's not forget the $2.5 trillion of bank reserves, the vast majority of which are held as "excess reserves," that the nation's banks are apparently quite happy to hold and which pay all of 0.25%. 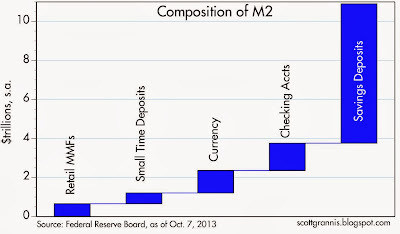 The M2 measure of the money supply is arguably the best measure of the amount of readily-spendable cash in the economy. 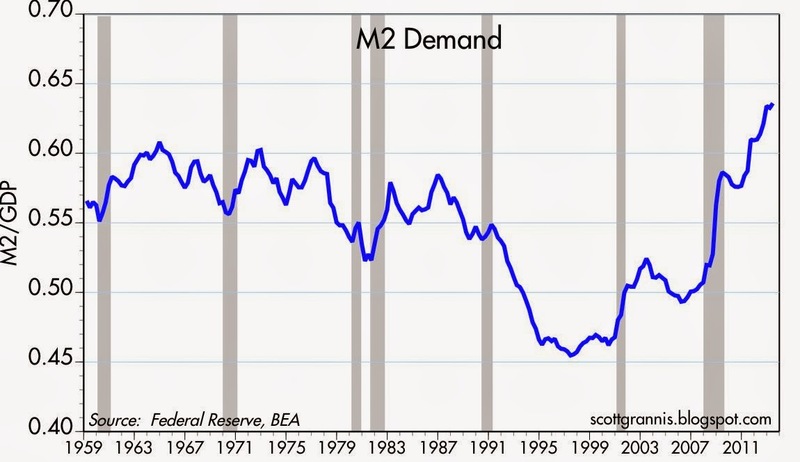 As the chart above shows, the ratio of M2 to nominal GDP is at record-setting levels. That means that the public's demand for "cash" has never been stronger. Households and businesses have never before held such a large proportion of their annual income in cash. That's remarkable on its own, but it's even more remarkable considering that the yield on all that "cash" has never been so low for so long (T-bill yields have been hugging zero for the past 5 years). It's a fact that the world's appetite for "cash" has never been so voracious. The flip side of today's strong demand for cash is a high degree of risk aversion. People are apparently content to sit on a mountain of cash earning almost nothing, while any asset with risk attached yields considerably more (see chart above), and total returns on most of the world's stock exchanges have been on the order of 20% so far this year. There's an old saying: "Don't fight the Fed." The Fed is arguably the most powerful institution in the world, and when they want something, they can get it. What they want is for people to be less risk averse: to spend some of their cash stockpiles, to hire more workers, and/or to expand their businesses. If they succeed, and they most likely will, then the world will attempt to reduce its holdings of cash and increase its holdings of riskier assets. 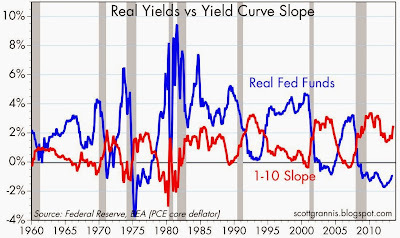 Of course, cash can't simply disappear, so the mere attempt to reduce cash holdings will mean that the relative prices of cash and riskier assets will change: riskier assets will go up in price (and down in yield), while cash will go down in price (and eventually up in yield when the Fed decides that it has achieved its objective). What I've just described has actually been going on for some time now. What the Fed is likely to announce in a few months won't be anything new, it will just be trying harder to do what they started to do in 2008. 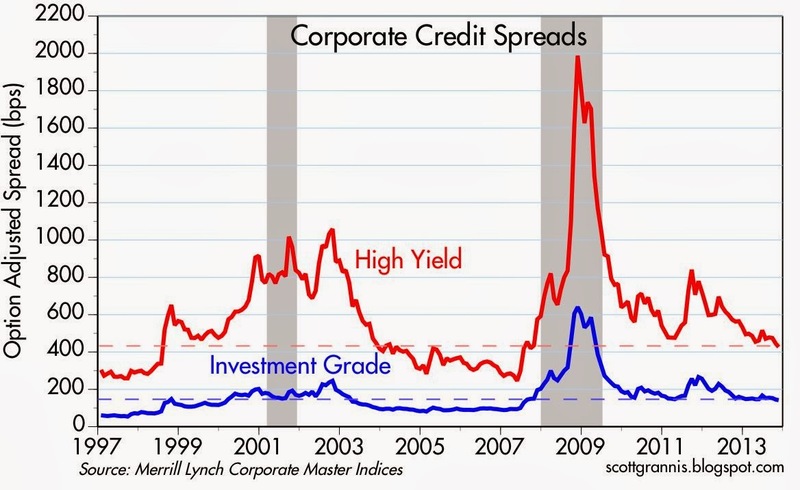 As the chart above shows, corporate credit spreads have been contracting for the past five years (i.e., the difference in the yield on corporate bonds and the yield on Treasuries of comparable maturity has been contracting). The world has been willing to pay an ever-higher price for corporate bonds relative to Treasury bonds because risk aversion has been declining. But spreads are still quite a bit higher today than they were before this whole mess started, so there is still plenty of room for improvement. 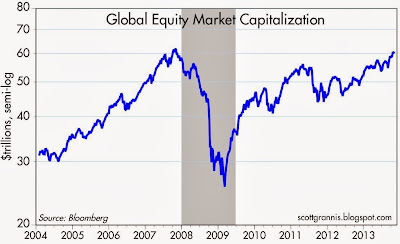 And of course there is the huge rally in most global equity markets, which directly reflects the decline in investor's risk aversion, bolstered by record-setting corporate profits. 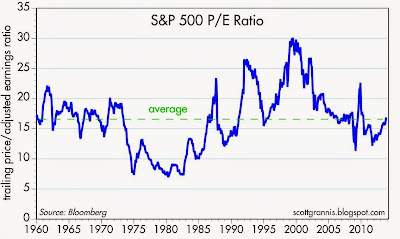 Yet PE ratios are still more or less average; despite record-setting profits, investors are still reluctant to pay above-average prices for those profits. If the Fed gets its way–and I have little doubt that they will—then all of the things we've seen happen over the past several years will continue. The prices of risky assets will continue to rise, nominal GDP will continue to expand, and bank lending will continue to expand. C&I Loans are already up by one-third in the past year. Banks have been slowly relaxing their lending standards for the past year or so, and that is very likely to continue. We could even see a pickup in real economic growth, but it's not likely to be very impressive unless fiscal policy takes a turn for the better (e.g., fewer deductions, lower rates, cuts in the taxation of capital). As risk aversion declines, the price of gold—the classic refuge from monetary and political risk—could decline as well. 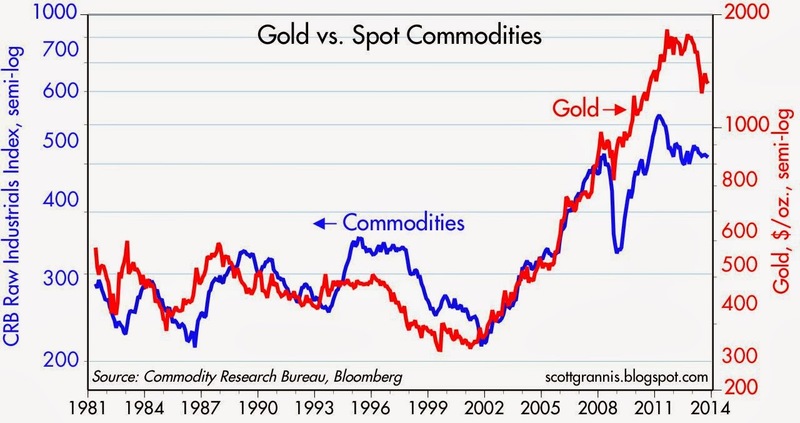 Gold is still trading at more than two times its average inflation-adjusted price over the past century. The end game is still out there on the horizon. That will come when bank lending becomes aggressive and the amount of cash out there starts increasing faster than the world's demand to hold it. At that point inflation will begin to pick up and the Fed will need to start chasing it by increasing interest rates. Eventually the Fed will raise rates enough to boost the demand for cash to such an extent that the world loses its desire to engage in risky behavior, and the economy will turn down. 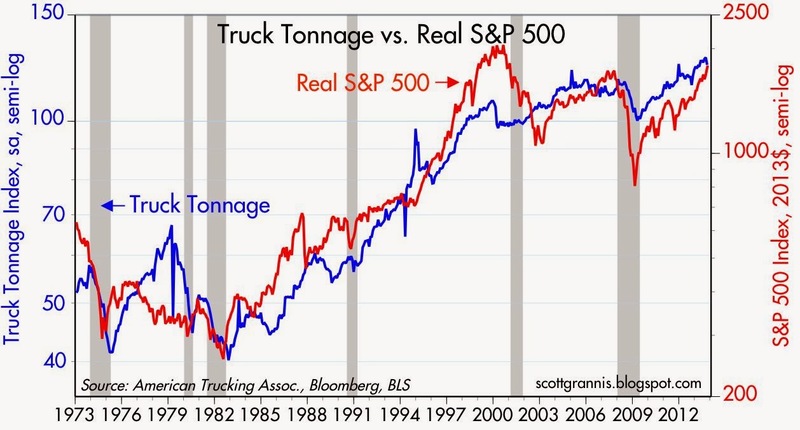 It's the same story that has played out in just about every business cycle in my lifetime. There's not much new under the monetary sun these days, it just goes by another name. Traditional Fed easing was accomplished by lowering interest rates; nowadays it takes a reduction in the unemployment rate threshold for Fed tightening. 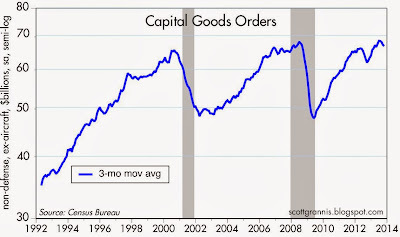 This post adds more meat to the theme of my post yesterday: the U.S. economy is doing OK, there are no signs of distress, no signs of impending recession, and only a few areas that are weak. So why must the Fed continue with its QE bond purchases? At some point they risk being too easy for too long, and that leads to rising inflation. 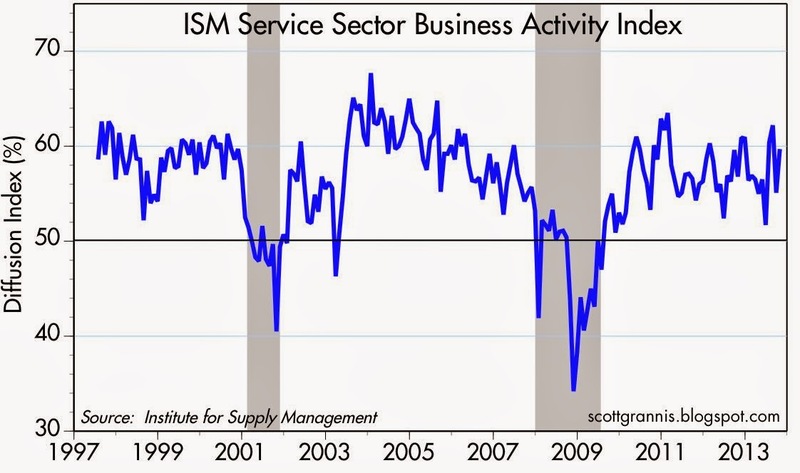 Like the ISM surveys of the manufacturing sector, the ISM service sector survey finds this very important sector of the economy in reasonably good shape. 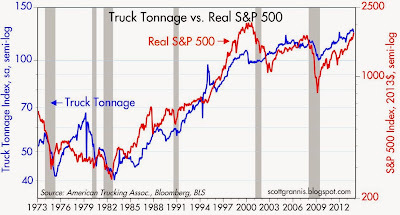 Just looking at the above chart, you would conclude that the current business cycle expansion is very similar to others. 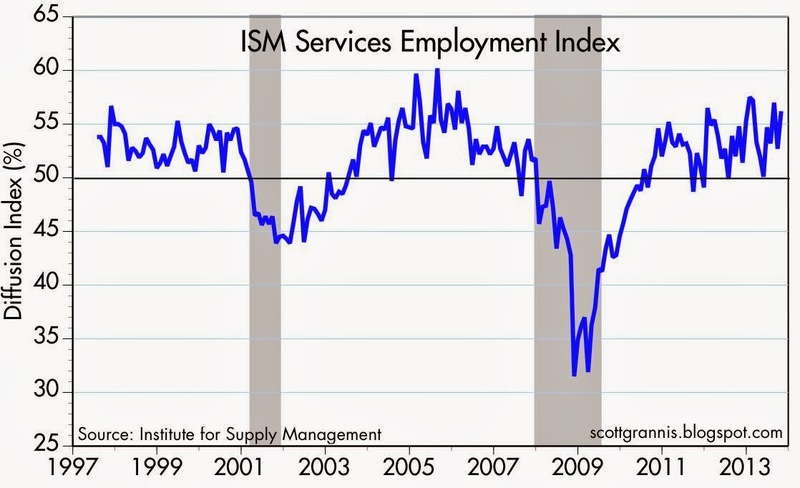 The economy hasn't been generating as many jobs as it usually would have, and the labor force participation rate is abysmally low, but as the above chart shows, service sector businesses' outlook for future hiring plans isn't greatly different from what it was in the previous expansion. It's even better today than it was in the go-go 1990s. 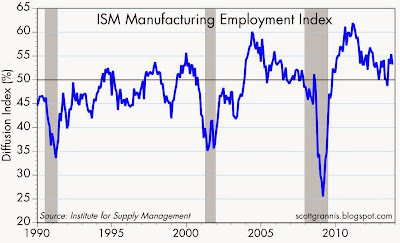 The chart above tells the same story as the manufacturing sector version featured in yesterday's post. 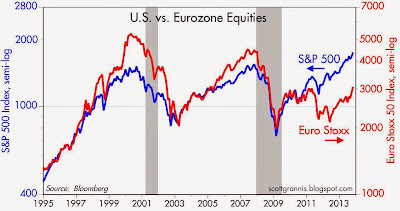 The Eurozone has emerged from recession and is beginning to grow modestly, having significantly underperformed the U.S. due to all the problems related to the PIIGS sovereign debt crisis. So where's the beef? 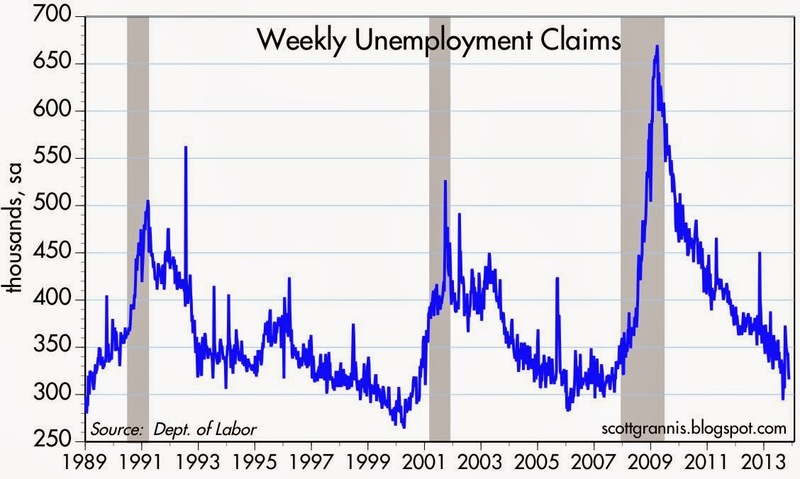 Where are awful conditions that warrant extreme monetary policy measures? The only real justification for continued QE lies in the fact that the world apparently remains very risk averse, and thus the demand for short-term safe assets (like bank reserves, which are functionally equivalent to T-bills) remains very strong. But this risk aversion is not likely to continue much longer, given the obvious and ongoing improvement in the U.S. and Eurozone economies. The above chart gives us the best indication that I'm aware of that the world's demand for safe assets (and by logical extension the world's risk aversion) is beginning to weaken. Demand for gold and short-maturity TIPS has fallen significantly this year, and equity prices have strengthened. 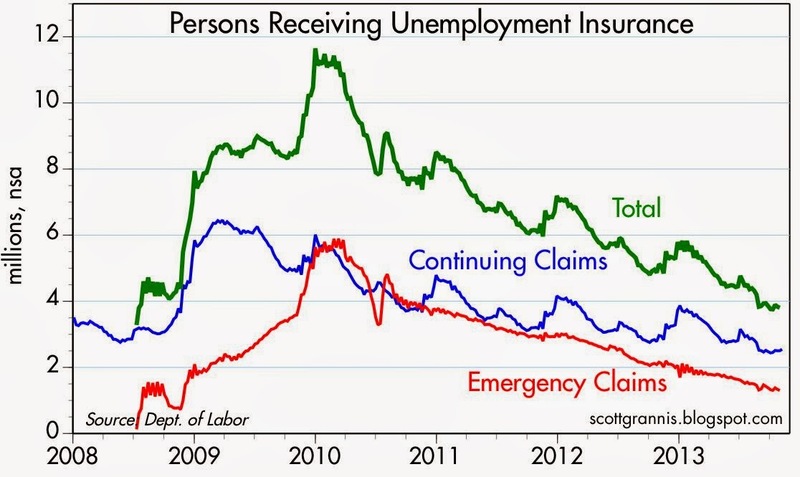 There's a lot less need for continued QE. The Fed's next move should be to taper its QE purchases, and it should come sooner rather than later. 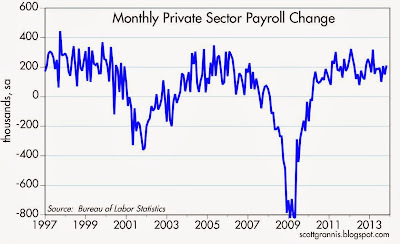 The economic stats continue to reflect an economy that is doing OK, though of course we'd like to see it stronger. But regardless of how strong the economy is or isn't, it's hard to see why the Fed needs to continue its extraordinary QE measures if almost all measures of economic activity are positive. I've argued for years that the real purpose of QE is not to stimulate the economy (monetary policy is a poor tool for manipulating growth) but to satisfy the world's demand for short-term, safe assets (e.g., bank reserves, which are effectively substitutes for T-bills). Is the demand for safe assets still so strong—because confidence is still so weak and risk aversion is still so prevalent—that the Fed must continue to buy bonds in exchange for bank reserves? That is the key question, but I worry that the Fed is not thinking in these terms. Instead, they are thinking about the need to stimulate the economy and avoid the risk of deflation. If they persist in misdiagnosing the economy's problem, we all risk the unintended consequences of a too-easy-for-too-long Fed, which would be higher inflation. The now Yellen-led Fed continues to worry about the health of the economy and continues to believe that more QE is necessary to avoid a slowdown and to avoid deflation risk. I don't see any signs of a serious slowdown in growth, and although reported inflation is relatively low, portents of deflation are very hard to find. 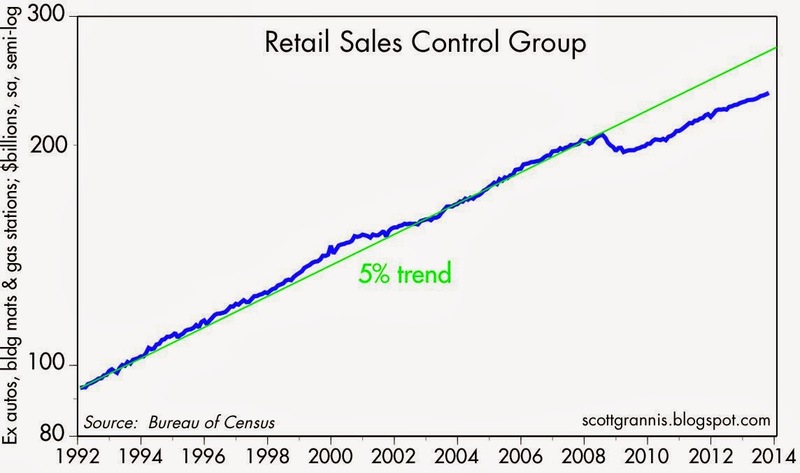 The last time the U.S. economy flirted with deflation was in the early 2000s. Leading up to that period, the dollar rose significantly, gold and commodity prices declined significantly, and monetary policy was very tight (real interest rates were unusually high and the yield curve was flat or inverted). Today, those same conditions are the exact opposite. 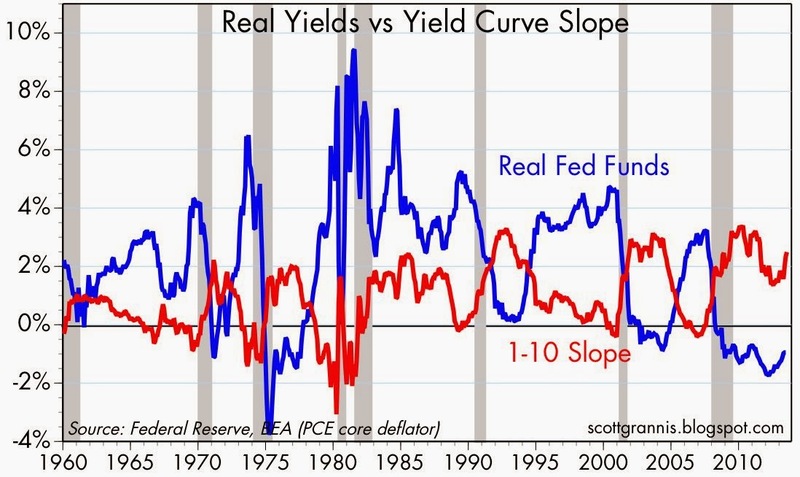 real interest rates are negative, and the yield curve is positively sloped. 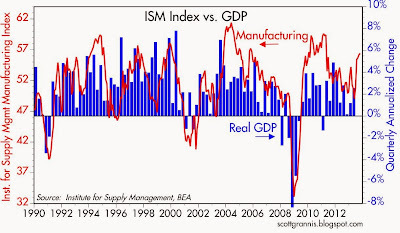 As for the economy, the ISM manufacturing index for October was stronger than expected (56.4 vs. 55) and is at a level that suggests that economic growth is picking up speed in the current quarter. The export orders component of the ISM index increased, and at this level it confirms that global activity has improved, beginning earlier this year in Europe and now, apparently spreading to Asia. The employment subindex remains at a modest level, confirming what we already know: businesses lack the confidence and/or the willingness to significantly expand hiring. 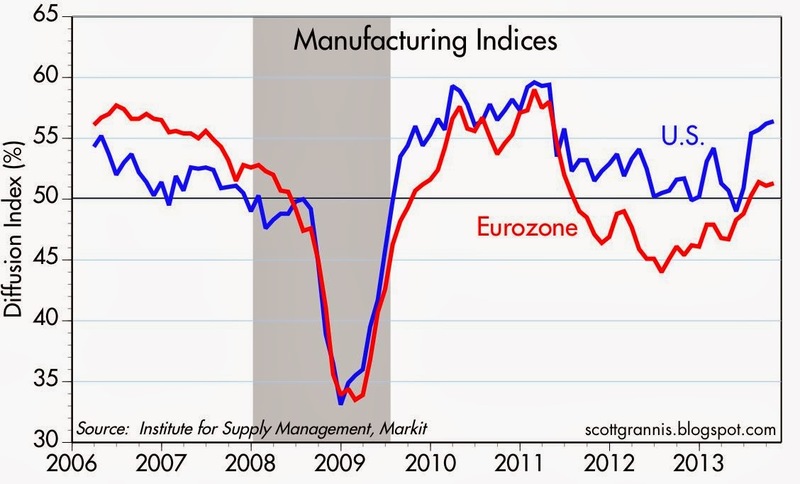 The Eurozone economy has improved, but it is not exactly off to the races. 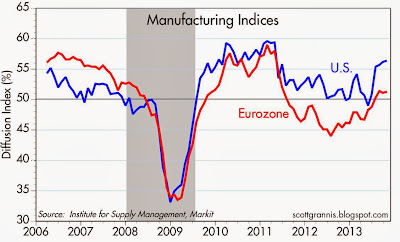 The PMI index of Eurozone manufacturing activity suggests that growth is still quite modest. But it is significant that the Eurozone economy is no longer plagued by recession. 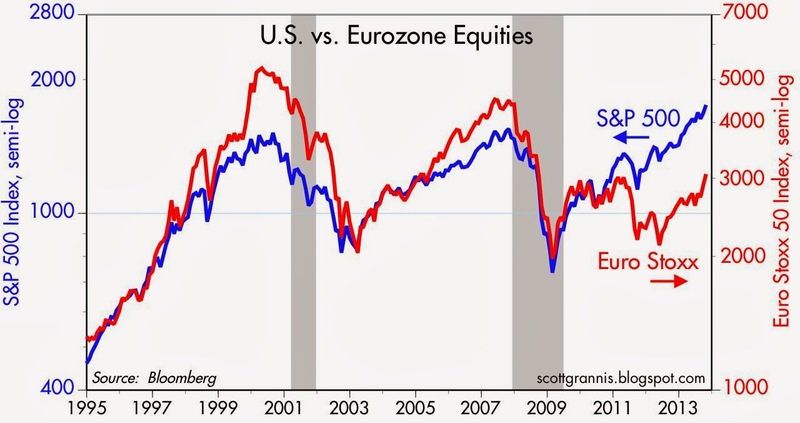 Even modest growth has been enough to boost Eurozone equities. The Euro Stoxx index is up almost 22% since June, almost double the 12% gain in the S&P 500 over the same period. The Eurozone was mired in a recession for two years, and now it's growing modestly. 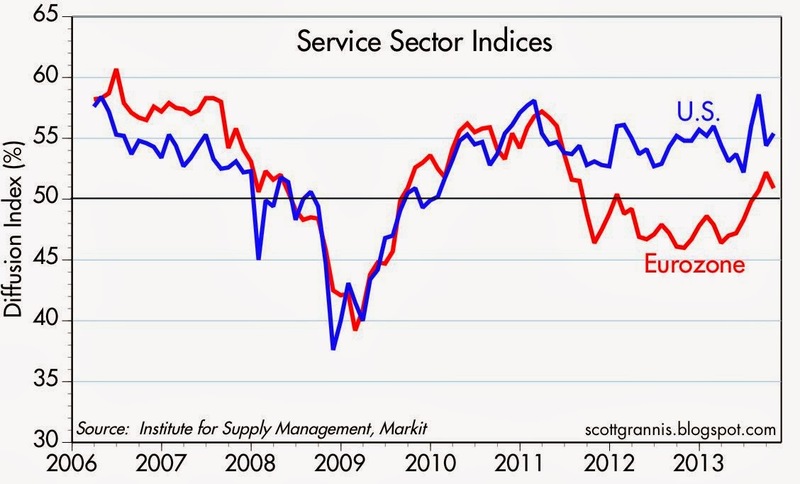 It's not that the Eurozone economy is suddenly very strong, it's that things are better than they were expected to be. Weak growth is much better than negative growth. Lots of things are doing OK. 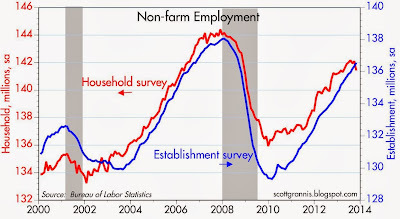 In the past year, housing has improved dramatically; auto sales have experienced a huge recovery; retail sales in general continue to rise; companies keep creating new jobs; incomes continue to rise; the equity market is hitting new all-time highs; money and liquidity have become abundant; and borrowing costs (real interest rates) are low. There are really only two things the Fed can point to in order to supposedly justify continued QE: the labor market—where unemployment remains relatively high and the labor force participation rate is dismal—and capital spending, which shows business investment is still meager despite record profits. (Come to think of it, slack business investment and slow hiring go hand in hand.) But it's difficult to see how more QE bond purchases are going to change people's minds about hiring and/or deciding whether to work or not. The Fed has been buying bonds by the bushel for over four years and it hasn't seemed to make much of a difference. One suspects that QE may have hurt more than helped. "QE forever" makes it seem that the Fed is worried, and that doesn't bolster confidence. Meanwhile, the increasing uncertainty surrounding the eventual unwinding of so much QE saps confidence. Although confidence in the economy seems to be lacking these days, the bond market is not worried at all about deflation. Inflation expectations—according to the Fed's preferred indicator, the 5-yr, 5-yr forward expected inflation rate embedded in TIPS and Treasury prices—have been averaging about 2.5% for the past several years and are 2.6% at the time of this writing. If anything, that tells us that the bond market expects inflation to rise from its current level (the CPI is up 1.2% in the past year). That seems reasonable to me, and it's not unreasonable to worry that inflation might be even higher. What we are learning with the Obamacare nightmare is that government is not very smart when it comes to big, complex things. Bureaucrats, and especially politicians, invariably ignore the unintended consequences of their policy actions. With the Fed seemingly intent on vanquishing the presumed onset of "dangerous deflation" (to quote a media pundit I read somewhere), it wouldn't be surprising to find, a few years from now, that the real threat is just the opposite: rising inflation. This is not meant as a clarion call for selling the dollar and buying gold, since I think the market has already done that in spades. 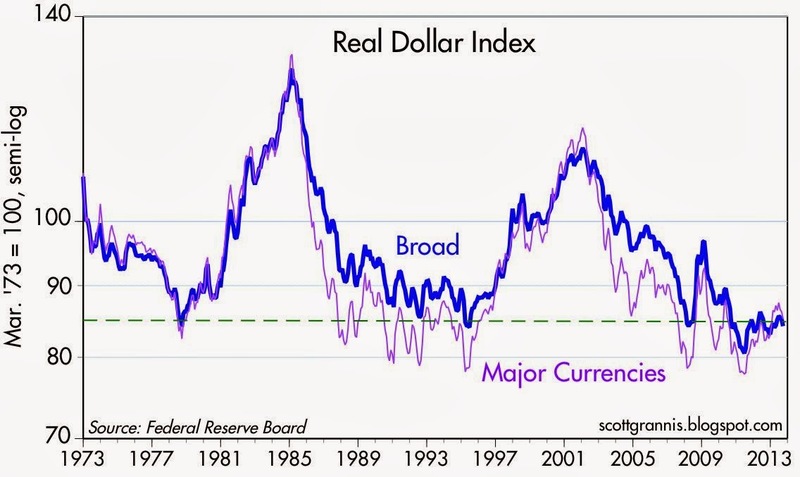 The dollar is weak and gold is still very strong because the market has worried for years that things would work out badly. Gold is down over the past two years because the market's worst fears have not come to pass. 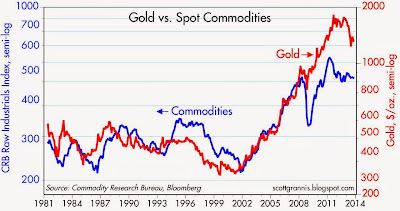 Gold is arguably still priced to a significant rise in inflation that has yet to occur.